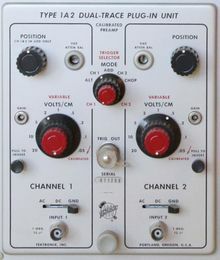 The Tektronix 1A2 is a two-channel plug-in amplifier for 500-series scopes. It provides a -3 dB point of 50 MHz in a 544, 546, 547, or 556, and 50 mV/div sensitivity. The Type 1A2 was introduced in 1964 together with Types 1A1, 543B, 545B, 544, 546, and 547. It was designed to replace the venerable Type CA, while the 1A1 delivered ten times the sensitivity at a higher price and is able to lock channel 1 to Type 547's timebase A and channel 2 to timebase B. On the other hand, Type 1A2 can select which channel provides triggering when the mainframe is set to Plug-In mode. They share some mechanical design, but the circuits have few details in common. The 1A2 remained available until the 500-series scope line was discontinued. The 1A2 uses a 7586 nuvistor at the front end as a cathode follower. Then one input of an NPN differential amplifier is driven to produce a differential current-mode signal at the collectors. Silicon diodes form an analog multiplexer that switches between the two inputs. A cross-coupled pair of PNP transistors forms a multivibrator that generates the voltages that control the diodes that select the input channel.